Acid premium cigars are made by hand in Nicaragua by Drew Estate. Each style of these hand-rolled premium cigars have a distinctive flavor and bouquet infused with rich botanical oils, and spices. Acid Cigars are widely recognized as an industry leader in the infused premium cigar market. 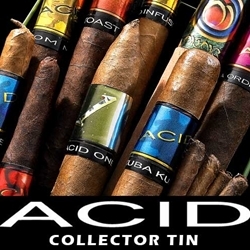 An easy and inexpensive way to try a variety of different styles of the Acid brand is to purchase the Acid Collector's Tin Cigar Sampler offered here at a great discount price. This hand-rolled premium cigar sampler makes a great gift for a friend or loved one, pick one up today for a discount price! Call us for more details!